(Newser) – It started with a scathing New York Times review, followed by pushback from the celebrity chef in the hot seat, and now the saga is ending with a high-profile restaurant closure. The AP reports that Guy Fieri's Times Square eatery, Guy's American Kitchen & Bar, has closed down for good, serving up its last dishes to the general public on Saturday; a private event was held there on New Year's Eve. 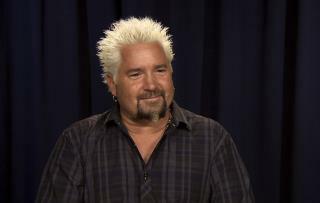 Guy Fieri didn't offer an explanation for the shuttering of what the Washington Post calls the "most mocked restaurant in America," which opened in 2012 and was instantly subjected to criticism from Yelp reviewers, fellow celebrity chef Anthony Bourdain, and Pete Wells, who penned the now-infamous review that asked: "Guy Fieri, have you eaten at your new restaurant in Times Square?" Guy should have given NYC trendies what they wanted. A 200 calorie plate of decorations costing $300.